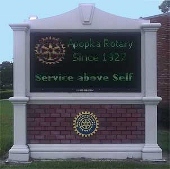 The Rotary Club of Apopka is proud to host the “Courtesy Shuttle” at various events in the Apopka area. 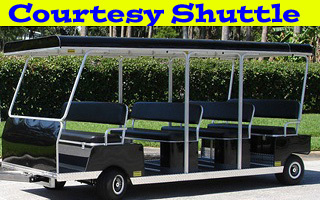 Currently the Rotary Club does not rent or loan out the shuttle for events. If you are interested in having the “Courtesy Shuttle” at your event please contact a Rotarian and have them submit a printable “Courtesy Shuttle Request Form” on your behalf. You can also complete the online request form by clicking on the "Shuttle Request" button below. b. The Rotary Club reserves the right to obtain a corporate “Sponsor” for the shuttle to create a fundraiser for the Rotary club. In addition, the club reserves the right to sell water to passengers as a fundraising opportunity. 2. The sponsoring Rotarian will coordinate volunteer hours, shuttle operation times, delivery/removal of the shuttle and a device to pull the shuttle. 3. The Rotary Club will need to be added as additionally insured on the insurance policy for the event with declaration page provided atleast 1 week prior to event.